There are 7 base note names, A - B - C - D - E - F - G (white) and 5 black notes in each pattern (octave) as picture below. Each of these can also be called a plus (+) or minus (-). For example, the first black key on the left can be called "+C" or "- D"; Note "E" can be called "- F", etc. 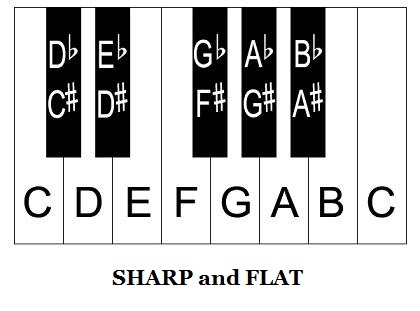 In short, plus (or sharp) note is the next note on the right (higher pitch, higher frequency). Minus (or flat) note is the next note on the left (lower pitch, lower frequency).